Customers line up at the Frank Gourmet Hot Dogs food truck recently at Dent Tower in Amherst. For more photos, visit buffalonews.com. Violet Beauregarde would be proud to know a Frank Gourmet Hot Dogs specialty frank is named in her honor. The “Charlie and the Chocolate Factory” character might rightfully recoil from anything blue – she inflated from experimental blueberry pie gum – but the allure of a rich, slightly sweet blueberry glaze blanketing a housemade hot dog, with cheddar cheese and a heaping mound of onion crunch for texture and more flavor, would overpower her restraint. Then again, Violet never did have much restraint. 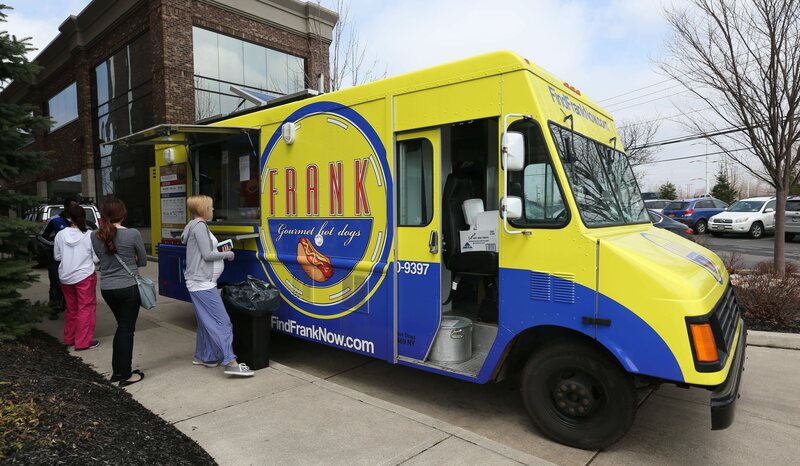 Frank Gourmet Hot Dogs is a bright-yellow food truck owned by brothers Frank and Paul Tripi. In 2013, they started a mobile food business the old-fashioned way – not by relying on others to buy into their concept through Kickstarter, but by saving and spending their own money. Now entering their third summer roaming the streets of Western New York, Frank’s owners have added a second truck – entirely with their own money – an adjusted vision and more employees. For almost all the hot dogs on Frank’s menu, customers get to choose their pleasure. There’s an all-natural, USDA-approved Original Frank, made from New York-pastured pork from the Piggery in Ithaca, free of preservatives, nitrates and artificial flavors; an all-beef dog from Brooklyn Hot Dog Co. and a vegetarian dog made up of lentils, brown rice and vegetables. Since the truck’s beginning, the Tripis have made their own hot dog rolls. If you’re hesitant to meet Violet Beauregarde ($5.50), the Proud Mary (bacon, spicy Tijuana cream cheese and caramelized onions on top of the Original Frank ($6) reels you in with chewy bacon and then smacks you gently with smooth yet potent cream cheese. We bet Creedence Clearwater Revival would mow down a few as a late-night, post-show snack. For those tired of standard ketchup-mustard-relish dogs, the Holy Moly (guacamole, sriracha, fried jalapeños and cilantro, $6) may leave a small fire in your mouth, but your taste buds won’t complain. The guacamole tames the heat of the sriracha and jalapeños a little, but not enough to make this a mild-mannered frank. The Modern Chicago (tomato jam, spicy house peppers, mustard and pickles, $6) and the Frank Bruni (spicy mustard and sauerkraut, $4.50) are sharp and zesty. The Impractical Joker (special sauce, lettuce, cheese, onions and pickles, $5.50) is a play on McDonalds’ Big Mac. The HogTied (bacon, barbecue sauce, cheddar cheese and onion crunch, $6) is for those craving a “cheat-day” comfort food. If you want the focus of the dog to be on the Original Frank, look no further than the standard dog (ketchup, mustard, onion, pickle, $4.50). Sides or smaller snacks include exceptional hand-cut fries ($3), Fritos Pie (Southern-style side with Fritos and chili, $4) and an assortment of hand-pies for dessert ($3.50, varieties change often but may include salted caramel apple and vanilla bourbon peach). Drinks (Coke, Diet Coke, Loganberry and bottled water) are $1. You may raise your eyebrows at a hot dog food truck enduring two years in a city that’s teeming with hot dog carts and still loves Ted’s Hot Dogs. But the Tripis have crafted a menu that not only sets it apart from its competition in terms of choice, but also quality. Don’t fear Violet Beauregarde, conservative eaters. Where: Varying locations around Western New York; see Frank’s Facebook page, FindFrankNow.com or call 440-9397. When: Daily lunches, except Sundays; dinner on Mondays, Thursdays and Fridays, including tandem nights with Dairy Queen on Niagara Falls Boulevard in Tonawanda. Most special events like Food Truck Tuesdays and Canalside events in the summer. Extras: Frank accepts both cash and credit.